A warm and open invitation to join the next #creativeHEmeetup on the 1st of May! Our next meetup will take place at the University of Salford on the 1st of May, 12-2pm in the Mary Seacole Building Room 136 organised by Neil Withnell and colleagues. The focus of this meetup is the creative use for teaching of stuff we would normally throw away, in other words rubbish. Please bring some samples/examples with you together with your ideas to share and discuss. Staff, students and the wider public, all very welcome. For this meetup we met at the University of Salford and decided to look critically and creatively at things we throw away but could indeed become valuable for learning and teaching. Yes, rubbish… it was fascinating to see what kind of rubbish colleagues brought with them and the ideas that were generated through these collectively. 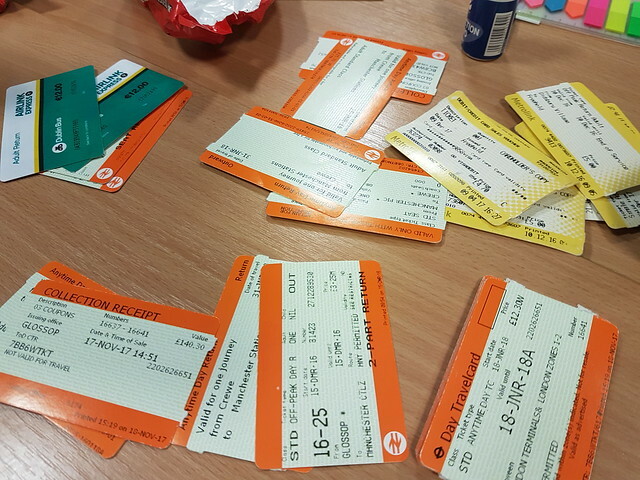 We spent most of our time exploring the possibilities that used train tickets brought for our teaching in a range of disciplines and professional areas and we said that it might be useful recording these and capturing them in a collaborative article. I hope we will be able to do this. Really looking forward to our last #creativeHE meetup this year in June which will take place at Manchester Met. This entry was posted in CreativeHE and tagged #creativeHE meetup, #creativeHEmeetup, CreativeHE by Chrissi Nerantzi. Bookmark the permalink.